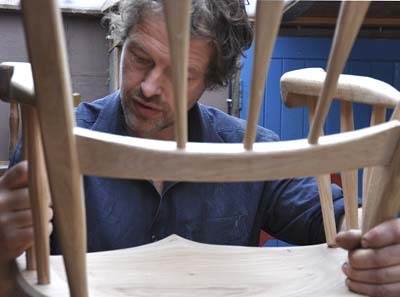 David Saltmarsh confesses to being ‘hooked on chair-making’. The Dorset-based craftsman produces his own version of the Windsor chair, experimenting with the traditional format to maximise both its comfort and visual impact. He discovered his passion almost accidentally although his father was a builder and he was brought up with a close knowledge of wood, it wasn’t until a chance meeting with a woodsman that he learnt about the craft of green-wood working. ‘Being in a wood with someone who could explain the proper use of timber, what to look for in a tree and how to work it in the best way was a pivotal moment for me,’ he recalls. Following this Damascene moment, David built himself his own pole lathe (the machine traditionally employed by bodgers to shape the green wood they use for making chair legs). It was a case of love at first touch-he was entranced by this method of turning wood, enjoying the silence and the hands-on experience. Experiments at home and a short chair-making course followed and he was off. Ash is his wood of choice. ‘It’s a great all-rounder-it looks beautiful, is strong, dries well and lasts for ages.’ Understandably, ash dieback is a major concern; David is frightened of its visual and ecological consequences and the potential loss of his prize material presents a serious economic challenge. He knows the implications of these virulent tree diseases, as elm, his preferred material for chair seats, is now sadly very difficult to source. He also uses oak, but, again, this can be difficult to track down locally-a problem that may well be exacerbated by acute oak decline. Other than the potential problems of sourcing wood, David is upbeat about his profession and its future. He has felt a real revival of interest in traditional crafts as people begin to prize the hand-made and locally sourced over the shoddy and mass-produced. The fact that his chairs are in such demand is proof that he has reason to be optimistic.